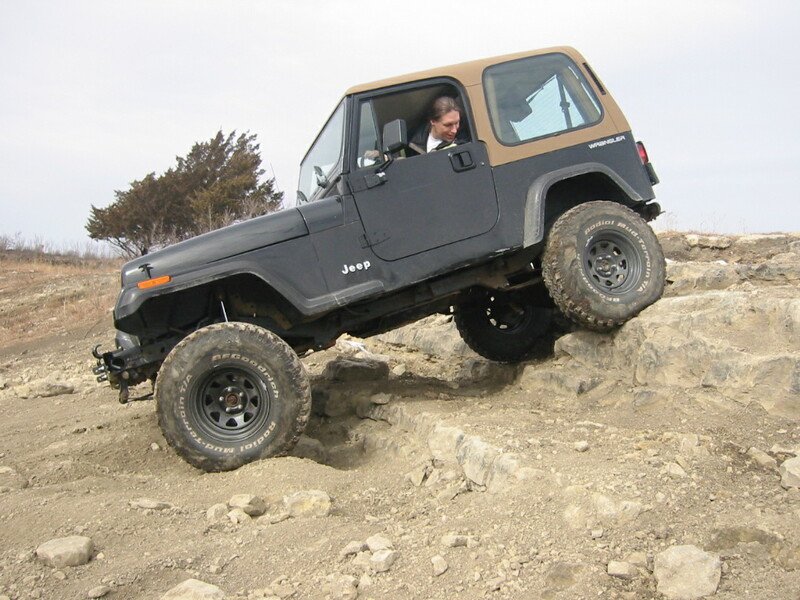 When I did the spring over axle lift on my '95 YJ 3.5 years ago, I kept the stock 15x7 steel wheels to use on my new 33x9.50 BFG MT tires. They got the job done, but the stock 5.25" of backspacing got increasingly annoying as time wore on. 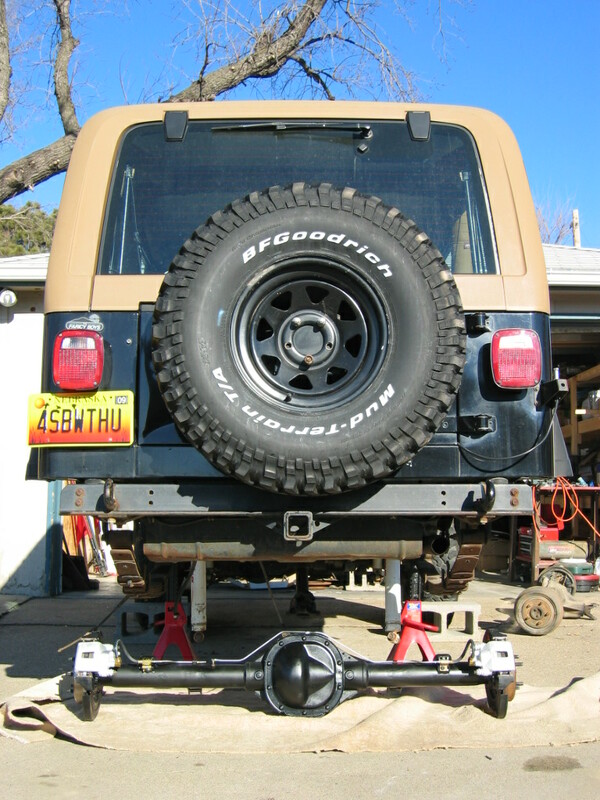 Most notably, the 33" spare tire interfered with the rear lift gate and only allowed it to open about 4" unless I removed the spare. That was enough to get my Hi-Lift jack in and out, but all other rear access basically had to be done through the lower tailgate opening. Second, the tire lugs rub the leaf springs under full turn lock, which effectively increases my turning radius. 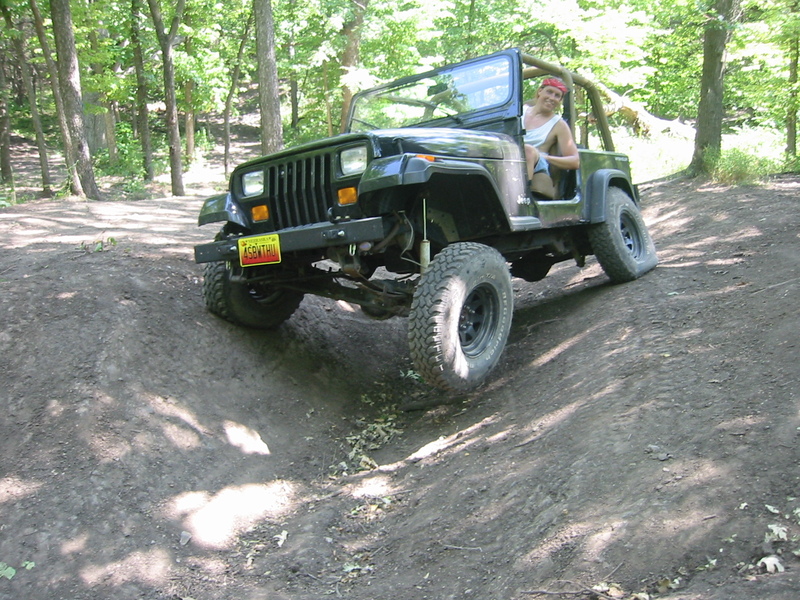 Third, being 9" taller but no wider than stock made my Jeep a little tipsy on off-camber trails. 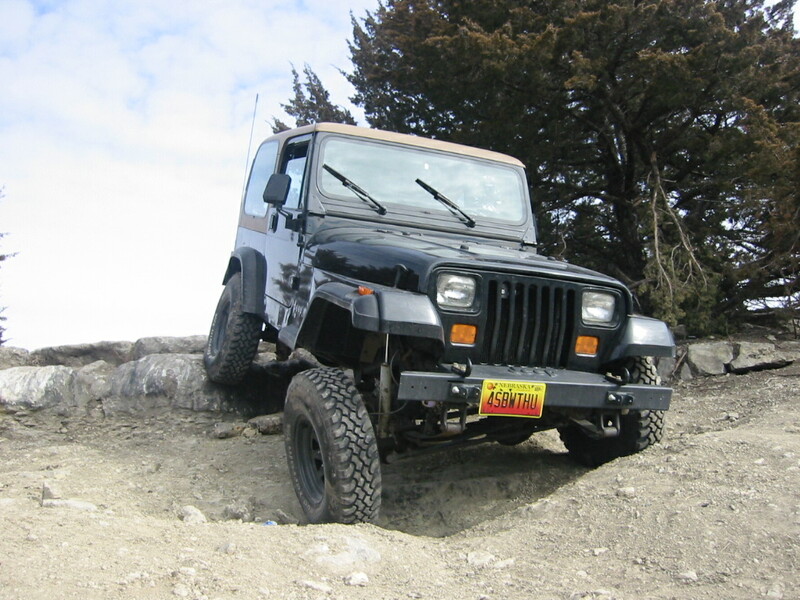 The only benefits of keeping the stock wheels were cost and the clean body that resulted from keeping the tires inside the fender flares. I started toying with the idea of getting rims with less backspacing about 3 years after doing the lift, but it didn't annoy me enough to shell out $200 for a set of 5 new black AR767's, which retail for just under $40 each. I looked around at various sources for some used wheels off a Ford Ranger or Explorer, which have the same bolt pattern, but I couldn't find any matched sets of five for a reasonable price. When a friend told me he could get new white wagon wheels for $26 each ($130 total), I figured I may as well go for it. I got a set of five Pacer 310W's with 3.75" of backspacing, which will push each tire out 1.5" farther than the stock wheels. That might be farther than I'd prefer for the wheels on the ground, but it should be just enough to let my lift gate open past the spare tire. We'll see. For some odd reason, white wagon wheels are always cheaper than their black counterparts. Unfortunately, I wanted black wheels instead of white, but I figured I could paint them and save a few bucks. In order to get proper paint adhesion, I sanded the shiny finish off the new wheels and wiped them down with brake cleaner to get all the dust off. I then proceeded to empty three cans of black enamel (which takes much longer to dry, but is more durable than laquer) spray paint on both sides of the wheels ($12). After several days of work, the end result is adequate. The aerodynamics of spraying into a bucket (which is essentially what a wheel is) doesn't allow lots of paint to reach the surfaces, so 4-5 coats were required to cover everything, and there were still some crevices where white shows through if you look carefully. In short, if I had it to do over again, it would be well worth the additional $58 to just by the black wheels from the start and avoid all the time & work that went into repainting the white wheels. Maybe if I'd gotten used wheels for $10 each, the $140 savings would have been worth the trouble, but saving $58 wasn't worth it for me. After getting them mounted & balanced, I'm still wishing I'd gotten the black AR767's. Some of the paint on the outer lip of the wheels got scraped off already during the mounting process. 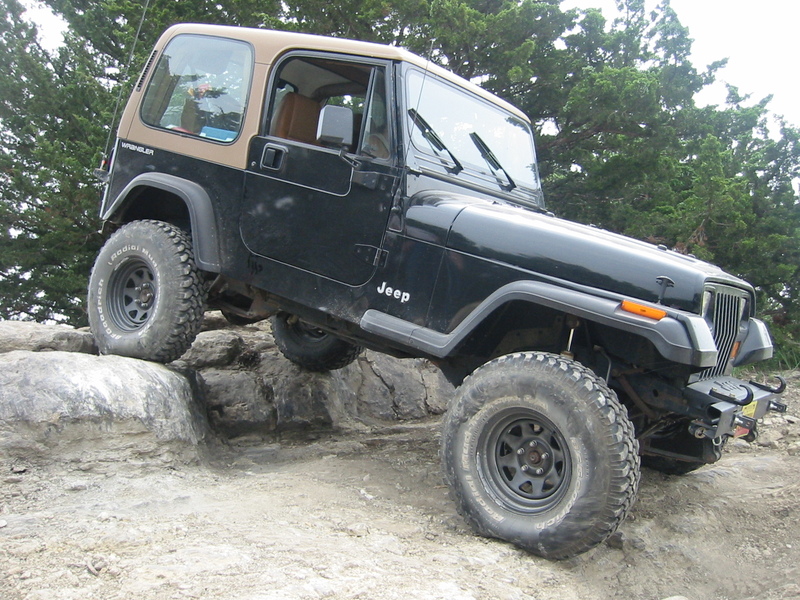 I can't wait to see what the rocks do off-road. The wheels are also very poorly balanced. Some of them aren't bad, but one in particular had about 6" of weights clamped along one side of the wheel. After my first highway/wheeling trip, I'm quite happy with the wheels. 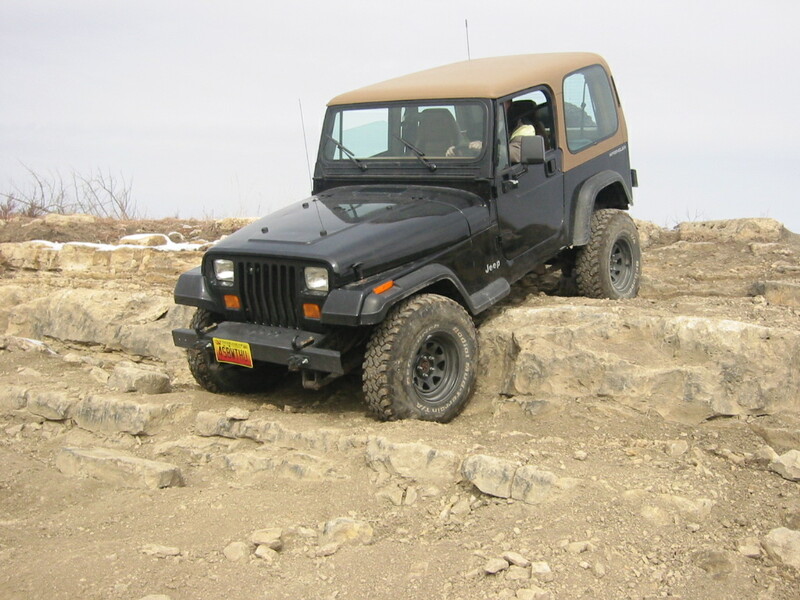 The tighter turning radius is nice, and I was pleasantly surprised that the additional 3" of track width makes the Jeep much more stable at highway speeds. The extra stability combined with the extra power from my new high-flow cat allowed me to actually use overdrive on the highway for the first time in years. 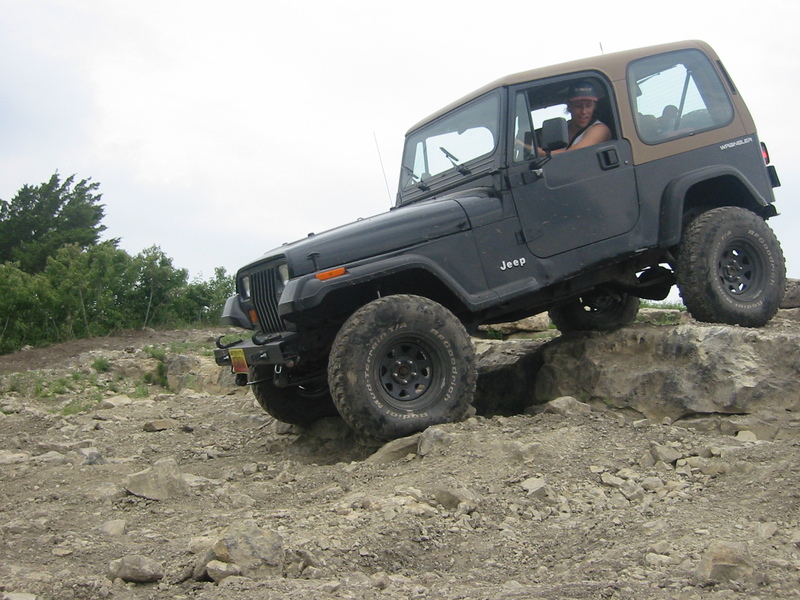 Below are a few shots of the wheels in action. 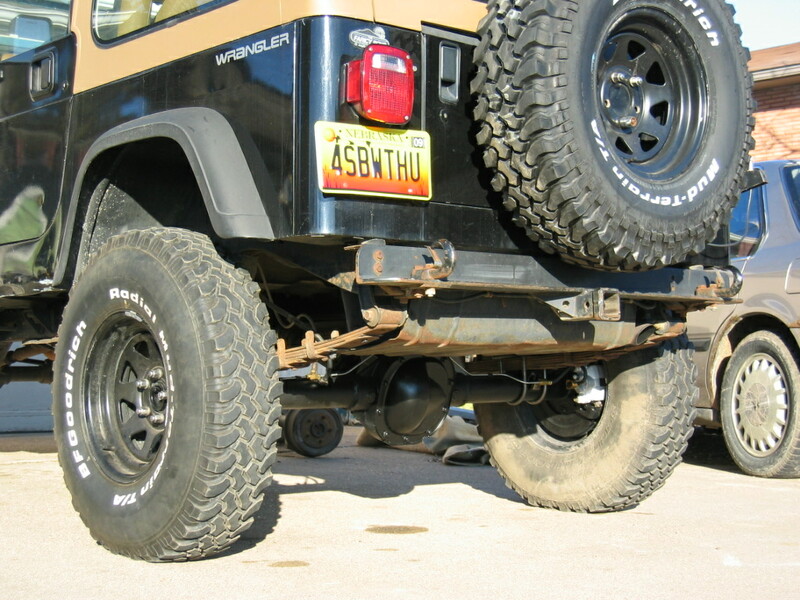 The spare tire in the later shots is a 33x10.50, while the others are all 33x9.50's.